10 Mins walk to Everything. Best View in DT Harbourfront Luxury Condo. There’s never been a better time to experience life by the lake. Pier 27 is unlike anything you’ve ever seen — an architectural masterpiece condominium residence, right at the water’s edge in vibrant. 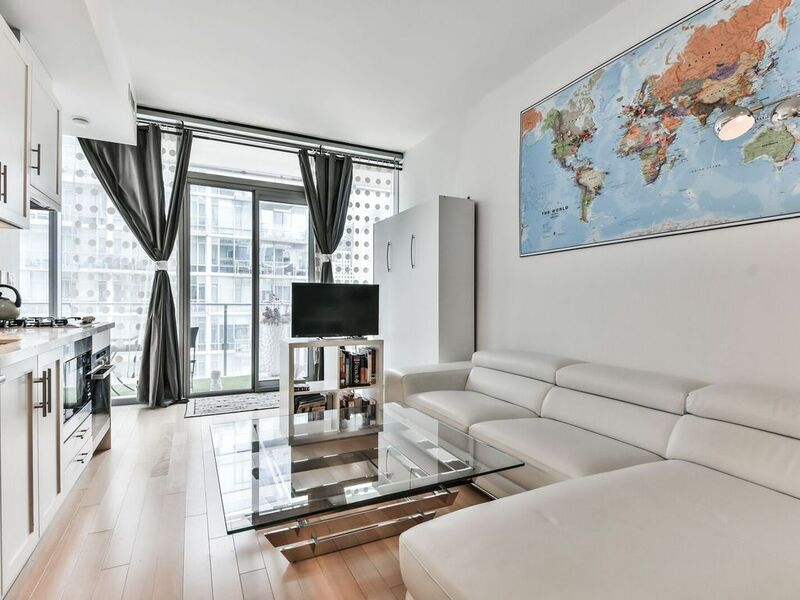 This experience luxury waterfront located at the heart of Downtown Toronto with a lake view side.Granite Counter Tops, Engineered Hardwood Flooring Throughout. Pier 27 is the epitome of urban chic, with magnificent suites and incomparable amenities that elevate Pier 27 to a new level of luxury living. As a world-class waterfront condominium with spectacular views of the city, water and sky. Resort Style Amenities Including Indoor And Outdoor Pools.Exercise Room,Yoga Room, Theater Room,Party Room,Guest Suites, 24 Hrs Security. This unit can sleep 4 people. There is a Queen size bed in the bedroom and a Queen size Murphy bed in the living room which is Wall Bed. WiFi included. Free Underground Parking. - Fully equipped kitchen with Meile System. - Full washroom with shower and bathtub. -50% deposit is due with reservation, balance is due 30 days prior to check-in. -Deposit is refundable less $50 up to 60 days prior to check-in. After that it is non refundable. Guest Booking Minimum age 21. No Parties. No Smoking. No Pet. This is high end Condo, please respect the neighbor. Reservations from local Toronto area guests not accepted. Do not book if from Toronto area as your reservation will be cancelled. Contact me beforehand to request an exception. Thanks! Please be considerate to all rules and regulations in place by management as they take it very seriously!! Not following this rule will immediately result in $1000 fine and you'll be asked to leave. Pier 27 is the epitome of urban chic, with magnificent suites and incomparable amenities that elevate Pier 27 to a new level of luxury living. As a world-class waterfront condominium with spectacular views of the city, water and sky. Granite Counter Tops, Including Bathtub & Shower. Downtown energy and waterfront adventures wait for you, just outside your door. Close to the Gardiner Expressway, close to everything — Pier 27 is the epitome of city living, right by the lake. Situated at the foot of Yonge St., the stunning suites offer unparalleled, panoramic views, water and sky. Incredible amenities offer everything you’d expect from a world-class residence. Incredible amenities offer everything you’d expect from a world-class residence. 4 Burner Miele Gas Stove. Functional Kitchen With Downsview Cabinetry, Gas Oven, Stainless Steel Appliances By Mile, Granite Counters. An Open Concept Living, Dining And Kitchen. Lovely Natural Light Throughout With Spectacular South West Facing Views Of The Lake And Courtyard Area. Hardwood Floor Throughout. CN Tower & Lake View. 158 km to Hockey Valley or Blue Mountain. 20 Minutes to Don Valley Golf Course. Outdoor Resort-Style Amenities; Indoor & Outdoor Pool. Great location with most amenities. Great gym and pool access. Great wifi. Place was smaller than I had imagined and the bed was awfully low to the ground. It would have been hard to sleep more than 2. Sorry. The bed is Zen style. And the condo is for two guest, maybe another two children for couple nights. Not for long term. Thanks! First, the positive: the condo is attractive, quiet and well located. The owner, Nancy, was quite good at trying to fix problems and her son was also most helpful. Negative: several points. First, the beds are very low - the one in the bedroom is maybe a foot off the ground; the Murphy bed is a little higher but still low. This is definitely not a place for people with mobility problems! After two nights of difficulty, my husband checked into a hotel for the remaining two nights of his stay. Second, TV reception was a problem. Nancy replaced the connecting box twice, but it was still difficult (sometimes impossible) to get reception. Third, the stove was so dirty that it set off the smoke alarm the first time we turned it on, and the supplies of pots, cutlery, etc. were skimpy. Fourth (this is not Nancy's fault! ), in the large underground garage, people drive very quickly, to the point where when turning one corner I had to scrape my car up against a concrete pillar to avoid a pickup truck barrelling toward me. Fifth, the sensor provided to give access to the garage stopped working (it was very old). Nancy promptly provided a new one. Sixth (again not her fault), while I was there a large pane of glass fell from the window of another condo unit. The portion of the driveway nearest to where it fell was roped off, but quite a few pieces of glass remained on the portion of the driveway leading into and out of the garage. It would have been quite easy to sweep them up; indeed, by the next day this had been done, but until then one did have concerns about one's tires. Seventh, we think there must have been water problems at some point because the hall floor is quite springy and there is what looks like a bit of mould in the bathroom. Also, the bathtub plug did not work. Finally, a new condo tower is being built next door, and the construction noise was sometimes quite bothersome. Great location in a few years when construction is done next door. This could be a great rental with some TLC. and comfortable furniture. Condo has had water damage and flooring was coming apart creating tripping hazard. Coffee table is way too big for the room and it is low to the ground which created several bangs to the shins. The mattress for the bed sits on the floor and the frame of the bed extends out about a foot from the mattress and you cannot walk around the bed. Upon move in we had to clean everything as it was not very clean.Some nice towels that didn’t feel like cardboard would be nice.Location to everything was great. I was away for two months. My son Kirk was taking care the cleaning and I just got schedule for repair flooring. Sorry about it. But I believe you are enjoy the stay in city. I’m really appreciate your business & wish you have very good life.